The range of motifs, techniques, and compositions on the Tanum rock carvings provide exceptional evidence of many aspects of life in the European Bronze Age. The continuity of settlement and consistency in land use in the Tanum area, as illustrated by the rock art, the archaeological remains, and the features of the modern landscape in the Tanum region combine to make this a remarkable example of continuity over eight millennia of human history. Northern Bohuslän is a land of granite bedrock, parts of which were scraped clean as the ice cap slowly moved northwards, leaving gently curved rock faces exposed, many of them bearing deep scratches made by rocks caught in the receding ice. These were the ‘canvases’ selected by the Bronze Age artists, all of them just above the shoreline of the period that began in 1500 BC, i.e. 25-29 m above today’s sea level. Archeology sites are often some of the most difficult world heritage sites to visit because there usually isn’t much to see. My previous visits to Ban Chiang in Thailand and the Sangiran Early Man Site in Indonesia left me very underwhelmed. Absent taking part in a dig (which you can’t do) there isn’t much to experience, regardless how important the sites might be. 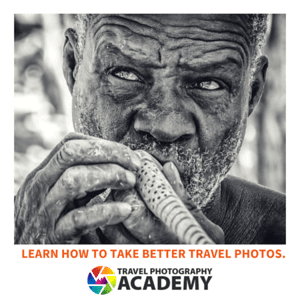 I didn’t even know what I should take a photo of at those locations. What is nice about Tanum is that the rock carvings are easily accessible. There are several carvings which are an easy walking distance from the road. Also, many of the primary sites have the carvings highlighted with an iron-based paint to make them stand out in the daylight. In addition to the rock carvings, there is a nice museum and visitor’s center as well as a historic village that approximates what bronze age life in Scandinavia was like. Tanum is located about 90 minutes north of Gothenburg just minutes off the E6 highway. The Rock Carvings in Tanum is a cultural UNESCO World Heritage Site in Sweden. It was inscribed into the list in 1994 and is located in Tanumshede, Sweden. This site preserves and commemorates the discovery of a large collection of petroglyphs (there are about 400 of these rock carvings and artworks) in Sweden. The high concentration of rock art is what is most impressive about this site, which is focused within a 45 square kilometer area. With carbon dating, archaeologists are able to estimate that these rock carvings were created some time in 1700 to 500 BC. Even though about 400 of the rock carvings in Tanum are located within the UNESCO World Heritage Site protected area, there are about thousands of petroglyphs in Tanum. The ones that belong within the protected area by UNESCO are noted for their high level of concentration in one area. Another impressive detail about the rock carvings in Tanum that are within the UNESCO protected area is that the rocks were the drawings were made is believed to be the coastline during that time. Today, it now is elevated off the ground by as much as 25 meters. 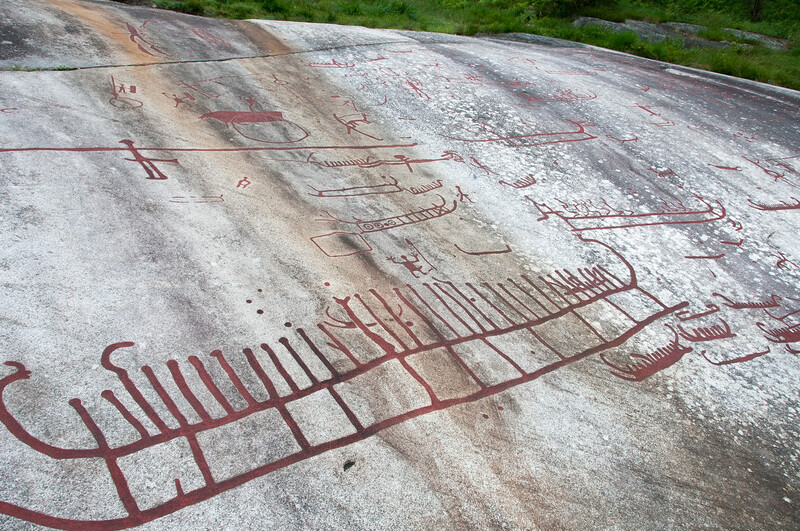 The Rock Carvings in Tanum are also recognized into the UNESCO list for its unique artistic quality. The artistic representation also provides a glimpse into the way of life for the people in the region during the Scandinavian Bronze and Iron Age. While it is known that these people were excellent craftsmen and are also skilled water travelers, many of the petroglyphs showcase that too and thus provide further evidence to support the claim. For instance, some of the drawings depict a Hjortspring boat that carries passengers. Other forms of transportation that were also showcased by the rock carvings include carts or wagons. 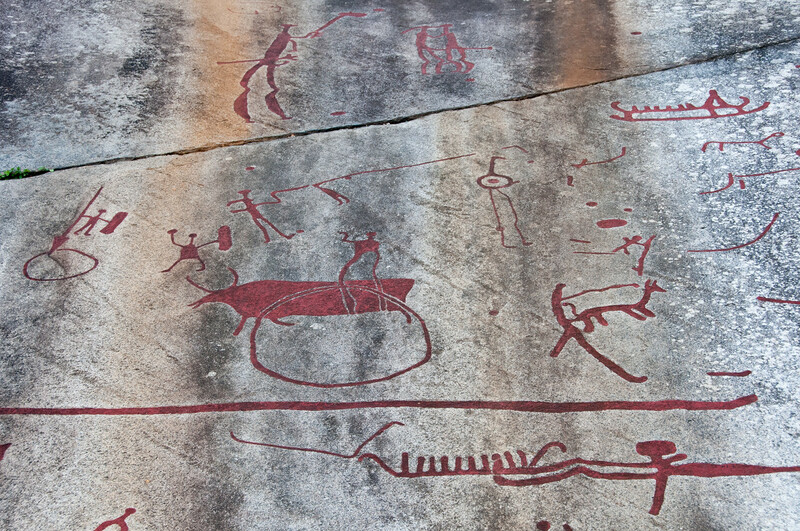 There are other motifs depicted by these rock art and carvings in Sweden that includes humans, fishing nets, birds, deer, bulls, sun, weapons and more. Therefore, it is like an artistic record from the past and the way of life that the earlier settlers in the region represented. Aside from the objects, a few of the Rock Carvings in Tanum also showed humans performing rituals. One of the largest rocks that contain these rock carvings is about 22 meters tall and 6 meters wide. According to archaeologists, this rock alone contained about 300 different carvings depicting a variety of subjects ranging from objects, humans, and various daily scenes. Since its discovery and after being named into the UNESCO World Heritage Sites list, there has been a lot of attention focused towards the Rock Carvings in Tanum. One of the biggest criticisms that the preservation society has earned flak for is in the way that these rock carvings were painted red in order to make them more visible to tourists. Some would consider that the act of painting red over these carvings made it lose its authenticity in the process as the original state of the rock carvings and drawings had been altered. UNESCO is also working on preserving these rock carvings as the natural processes and the elements threaten to wash them out. For instance, acid rain is the biggest threat to these cultural items as they are in danger of being eroded. 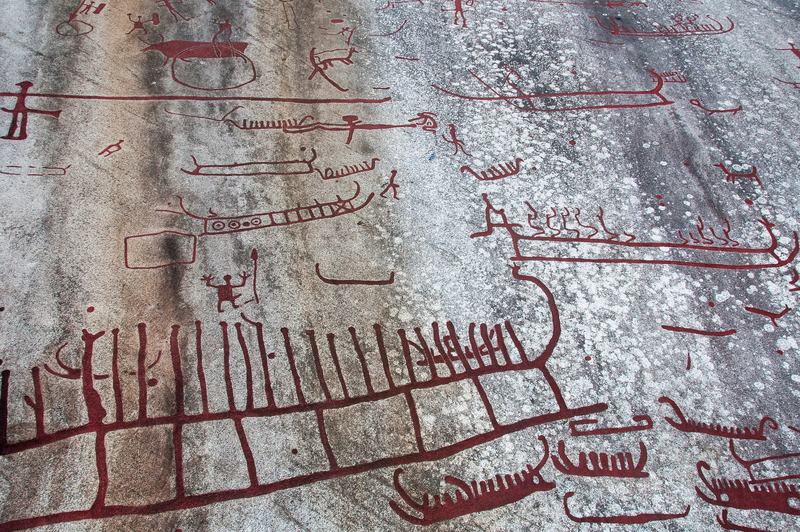 To this day, the rock carvings in Tanum have an average of 100,000 tourist visitors per year. These visitors are prohibited from touching or walking on these drawings. View my complete list of UNESCO World Heritage Sites in Sweden.